Blogging from my iPad at the 3rd Annual IP Law Symposium in Orlando. WordPress.com doesn’t have a liveblogging feature, so please refresh this post often to get the updates. Lots of familiar faces from my old firm and from colleagues past and present. 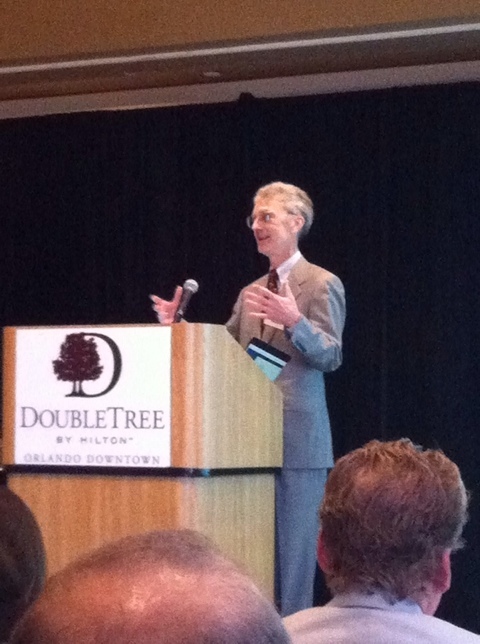 Scott Bain of the SIIA gave an interesting overview of the first sale doctrine in copyright. Recent cases have closed a loophole wherein companies would legitimately buy a copyrighted item overseas and then import it into the US for sale at a cheaper price than the manufacturer intended. While the first sale doctrine gives you the right to resell a CD or other copyrighted work that you lawfully purchased in the US, that doctrine will most likely not apply to items imported from abroad. 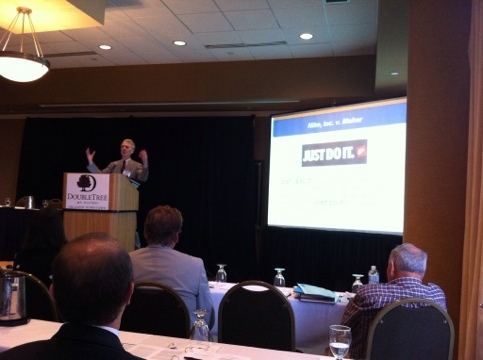 John Welch of the TTABlog just gave a humorous, somewhat self-deprecating talk regarding trends at the TTAB. He predicts that lack of bona fide intent to use will be the new hot topic – replacing fraud as the trend to watch. I’ve never seen a presenter admit to getting bored by his own presentation. Funny guy. Glad the IP Committee was able to bring him in. Takeaway: test juries show that jurors in patent trials have no flipping clue what attorneys are talking about. They need lots of hand holding and visual aids to explain the technology and patent claims. The session at 11:30 should be good. Third Party Liability in IP. Many of our firm’s clients operate websites that allow user-generated content. These third-party users can sometimes expose the website operator to liability for copyright and trademark infringement depending on the facts and circumstances. We’re well-versed in this area of law, but it’s always good to hear from academics and other colleagues. No Megaupload reference yet… Nice overview of the cases and elements for trademark, patent, and copyright secondary liability. Here comes the juicy stuff. DMCA safe harbors. Red flag knowledge of infringement is hard to prove, but it’s a potentially-dangerous concept for defendants. Speaker suggests that using accomplice liability theories from criminal law is not appropriate for civil secondary infringement tests. Future developments: more criminal enforcement and criminal laws directed toward infringement. (first megaupload reference). Excellent presentation by Anne Gilson LaLonde (yes, that Gilson) re. non-traditional trademarks (scent, flavor, color). Very entertaining and informative. Now, Leslie Lott is discussing the color red as a protectable trademark for Louboutin shoes. Apparently they’re a big deal. Still Leslie. Great overview of the new gTLDs. The cost to bring a new gTLD to market is huge. Likelihood of return on investment? Will consumers use .hilton, .lawyer, .restaurant, etc.? Last presentation and this one concerns nerdcore patent stuff. Was tethering my iPad through my iPhone. iPhone died. Found an open network for the iPad… Back in business. Good stuff. Domaintools.com, arin.net, archive.org. This is the geekdom I enjoy. Learning that you can combine this type of stuff with lawyering is what prompted me to go to law school. Nice to see you at the symposium. Thanks for this writeup. Hope to see you at the 4th annual symposium next year.